ASSEDA has been incorporated into Cytognomix’s MutationForecaster system. Current paid subscribers will have access to splice.uwo.ca until their subscription ends. Previous trial users of ASSEDA may register with MutationForecaster. After logging in, subscriptions to use ASSEDA and all other products can be activated through the Account menu on the system. The software is described in “Prediction of mutant mRNA splice isoforms by information theory-based exon definition,” by Eliseos Mucaki, Ben Shirley and Peter Rogan, published in Human Mutation in 2013. The paper (link) was highlighted by the journal editors and is open access. 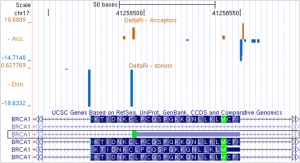 Since this publication, information models for 10 splicing regulatory binding factors have been added to ASSEDA and incorporated in the computation of exon definition. The next release of the software will filter results to relevant mutations, by limiting results to expressed factors and target genes based on tissue of origin. Resources: Video Tutorial on the use of the ASSEDA server on You Tube. ASSEDA is is covered by US Patent 5867402 and patents pending. A Web-based online version of the pipeline – now embedded within our MutationForecaster system. Contact us to submit a purchase order or for long term access. The standalone product can be custom integrated into your existing NGS software analysis pipeline . It produces the same results as our own web-based service. Please contact Cytognomix if you are interested in this capability. It is also distributed as an Application in the Illumina’s BaseSpace system. Download the Shannon_Pipeline Documentation or view a video presentation of results that can be obtained. Previous trial users of the Shannon pipeline webservice may register with MutationForecaster. After logging in, subscriptions to use the Shannon pipeline and all other products can be activated through the Account menu on the system. Read testimonials for the Shannon pipeline … Also, US National Cancer Institute renews license to the Shannon human mRNA splicing mutation pipeline. How to interpret the results: Play video. Basic functionality and how to submit your data: Play video. and contains preset mutation filters to simplify analyses. Peer-reviewed publications: B.C. Shirley, E.J. Mucaki, T. Whitehead, P.I. Costea, P. Akan, P.K. Rogan, Interpretation,Stratification and Evidence for Sequence Variants Affecting mRNA Splicing in Complete Human Genome Sequences, Genomics Proteomics Bioinformatics (2013), 11:77-85. Mucaki, E*, Caminsky N*, Perri A, Lu R, Laederach A, Halvorsen, M, Knoll, JHM, Rogan PK. A unified analytic framework for prioritization of non-coding variants of uncertain significance in heritable breast and ovarian cancer, BMC Medical Genomics, 9:19, 2016. The Ontario Genomics Institute (OGI) and Cytognomix Inc. hosted a 30 minute Webinar about the Shannon Human Splicing Pipeline – software for genome-scale splicing mutation analysis. The webinar powerpoint slides are available (ShannonPipeline-OGI-Webinar-Presentation). Wouldn’t you want the most reliable data on the market for your clinical studies? 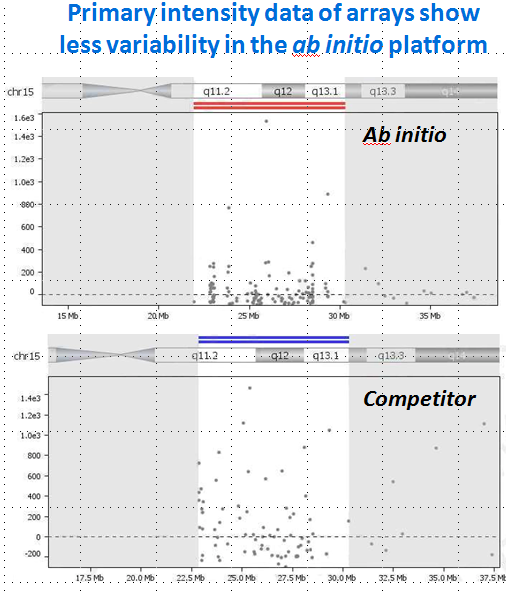 Cytognomix can offer novel array CGH designs with expanded probe sequence repertoire and significantly improved reproducibility than other available platforms. This technology enables higher density arrays to be produced which provide higher granularity and more consistent copy number calls. 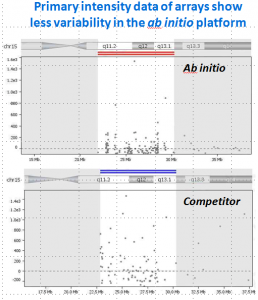 Arrays can be targeted for specific genomic regions to refine results from lower resolution genome-wide studies or developed for genome-wide applications. A subscription to our MutationForecaster system provides genome browser access to our genome-wide custom probe designs through the cytogenetic Visual Analytics Decision Support Tool. 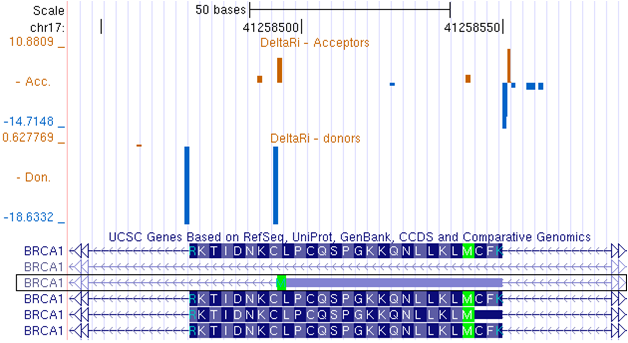 This tool displays the locations of oligonucleotide products used in microarray design. Please contact us regarding these designs and protocols. 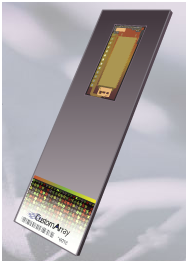 Targeted aCGH arrays are based on our patented ab initio technology (US Patents 7,734,424, 8,209,129, and 8,407,013).